After suffering a cataclysmic earthquake, the U.S. government has deemed Gotham City as uninhabitable and ordered all citizens to leave. It is now months later and those that have refused to vacate No Mans Land live amidst a citywide turf war in which the strongest prey on the weak. As gangs terrorize the ravaged populace, the Scarecrow uses a church relief project as a real life lab to test his experiments in fear. 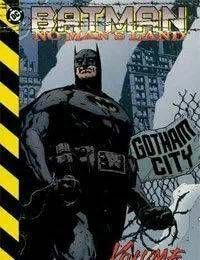 But with the return of the vigilante, Batman, and the appearance of an enigmatic new Batgirl, justice returns to Gotham.<br />This volume is the first of five that recounts the NO MANS LAND storyline, and collects two four issue storylines No Law and a New Order featuring Scarface, and Fear of Faith featuring Scarecrow.